This recipe was one of the entries from chef Michael Chiarello on the final episode of Top Chef Masters. The short ribs looked wonderful and received rave reviews from the judges; Michael came in 2nd place overall but this is a 1st place dish! Make the brine: Bring all ingredients to a boil in a sauce pan, stirring to dissolve sugar. Cool completely. Cover short ribs with brine and refrigerate 3 hours. Cook the ribs: Preheat oven to 300-degrees F. Remove short ribs from brine and pat dry. Heat a large high-sided sauté pan over moderately high heat until hot. Add a film of olive oil. When oil begins to smoke, brown short ribs on all sides. (They brown quickly because of the sugar in the brine.) When richly browned, place in a dish that can go from stovetop to oven. Add onion, carrot and celery to sauté pan and cook over moderately high heat until vegetables are well caramelized. Transfer vegetables to dish with short ribs. Add red wine to sauté pan and simmer until reduced by half, scraping up any stuck-on bits with a wooden spoon. Add stock, bring to aboil and pour over short ribs. Bring short ribs to a boil on top of the stove, then cover and bake until fork-tender, about 4 hours. 5 Onion Cavalo Nero: Slowly sweat all onions and carrot in olive oil. Add raisins, sweat briefly. Add cabbage and cook slowly stirring frequently until cooked very soft. This will take two hours. 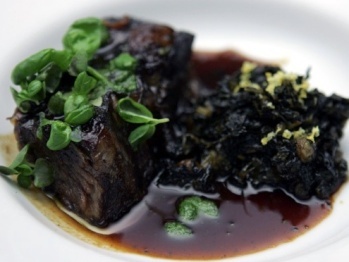 Serve ribs topped with some of the Onion Cavalo Nero.